Discussion in 'General discussion' started by David, Feb 11, 2017. Although this is already being widely reported, I thought I should include this announcement on this forum. Vatican City, Feb 11, 2017 / 09:21 am (CNA/EWTN News).- Pope Francis on Saturday appointed Archbishop Henryk Hoser of Warszawa-Praga as a delegate of the Holy See to look into the pastoral situation at Medjugore, the site of alleged Marian apparitions in Bosnia and Herzegovina. “The mission has the aim of acquiring a deeper knowledge of the pastoral situation there and above all, of the needs of the faithful who go there in pilgrimage, and on the basis of this, to suggest possible pastoral initiatives for the future,” stated a Feb. 11 communique from the Vatican Secretariat of State. “The mission will therefore have an exclusively pastoral character,” it added. Greg Burke, the Holy See press officer, strenuously reiterated the pastoral, and not doctrinal, nature of Archbishop Hoser's mission, while speaking at a press conference. “The special envoy won’t enter into the substance of the Marian apparitions, which is a doctrinal question in the competency of the Congregation for the Doctrine of the Faith,” he said. The alleged apparitions originally began June 24, 1981, when six children in Medjugorje, a town in what is now Bosnia and Herzegovina, began to experience phenomena which they have claimed to be apparitions of the Blessed Virgin Mary. According to these six “seers,” the apparitions contained a message of peace for the world, a call to conversion, prayer and fasting, as well as certain secrets surrounding events to be fulfilled in the future. These apparitions are said to have continued almost daily since their first occurrence, with three of the original six children – who are now young adults – continuing to receive apparitions every afternoon because not all of the “secrets” intended for them have been revealed. In January 2014, a Vatican commission completed an investigation into the supposed apparitions' doctrinal and disciplinary aspects, and was to have submitted its findings to the Congregation for the Doctrine of the Faith. When the Congregation for the Doctrine of the Faith will have analyzed the commission's findings, it will finalize a document on Medjugorge, which will be submitted to the Pope, who will make a final decision. Pope Francis visited Bosnia and Herzegovina in June 2015, but declined to stop at Medjugorje during his trip. During his return flight to Rome, he indicated that the process of investigation in the apparitions was nearly complete. When journalists noted this point at Saturday's press conference, Burke responded that the doctrinal question of the alleged apparitions “are still being studied … this is neither a recognition nor a negative judgement. That is always a doctrinal question separate from this, which is pastoral. If you read [the communique], you can’t read any doctrinal judgement” in the pastoral appointment of Archbishop Hoser. Rather than being involved in the doctrinal questions, Archbishop Hoser's mission is a matter of “people’s needs,” Burke emphasized: “pastoral life, liturgy, catechesis, sacraments and the experience of devotion they have there,” but not the management of local parishes. 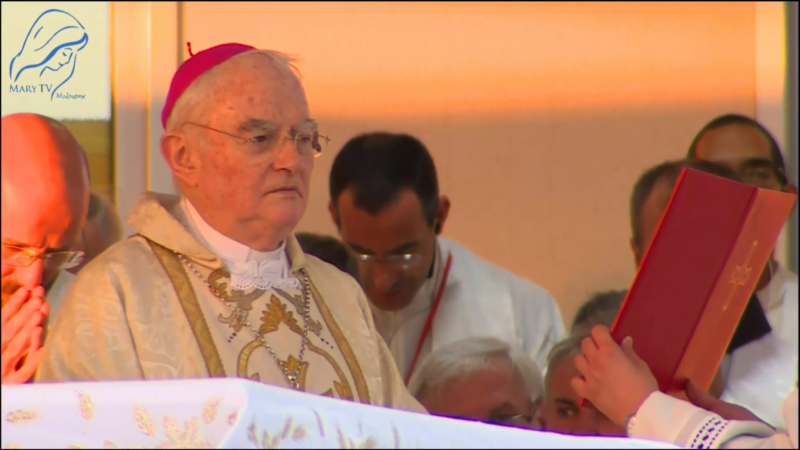 Archbishop Hoser will remain Bishop of Warszawa-Praga, and is expected to complete his role at Medjugorje by the summer. Archbishop Hoser: "I believe in Mary, in all of her manifestations"
Following his appointment as the Holy Father's ''special envoy" to Medjugorje, Archbishop Henryk Hoser has given a short interview to the Italian website LaFede Quotidiana. He was asked if he had expected his commission and replied that he didn't know the reason why Pope Francis assigned him the post. "Of course, I am grateful," he continued "I 'will give it all my comittment. The mission does not alarm me." Questioned about being defined a 'conservative' bishop Msgr Hoser said, "I do not define myself in that way. Rather, I am a man of the Church who seeks to be faithful to the Word, to doctrine and tradition, to all the documents . If this means 'conservative', then I'm conservative." The Polish prelate then agreed that the people of Poland generally nourish a positive feeling towards Medjugorje and added: "The Catholics of this nation, which is deeply Marian, have a positive view about Medjugorje and a lot of them go there, as from other nations, so this means something. But I will not deal with theological aspects or apparitions, only with the Pontifical commission. My task is pastoral." Archbishop Hoser is noted for his defence and promotion of family values and confirmed the Virgin's role in this. It's true. It is very important to invoke Mary for the protection of the family, formed by a man and a woman united by the sacrament of marriage. At Medjugoije we find the Rosary, Eucharistic adoration, fasting and penance are present, and these encourage the development of faith. Asked about the 'fruits' of Medjugoije the 'special envoy" reiterated that his role is confined to pastoral issues and not doctrine, :"not to the issue of truthfulness". He added. 'With regard to the fruit in souls. I find positive. By fruits I mean the practice of the sacraments, conversions, change of life, participation in the Mass. This is what happens at Mediugorje - we cannot deny it or do without it pastorally. Asked about his recent recovery from maleria and the rumour that he had prayed to Our Lady of Medjugoije, archbishop Hoser responded: "I contracted maleria in Africa. I have prayed to the Virgin. I believe in Mary, in all her manifestations. In a telephone interview with Vatican Radio on Monday, Archbishop Henryk Hoser explained his "special envoy" appointment as an example of the Holy Father's concern for the situation in Medjugoije to be clear and orderly, and as the Pope's envoy he is able to assess the situation on the ground and recognise any opportunties that arise. "Above all", he added "it is about regular, pastoral reception of the millions of pilgrims coming to Medjugoije. This high number is a challenge for the Church and a call to improve the reception if possible." Msgr Hoser also spoke of two crucial aspects regarding Medjugoije. "On the one hand are the phemomena and are the messages of the Mother of God genuine? This was the subject of the investigation by the special commission led by Cardinal Ruini. The second aspect is that which has been entrusted to me: it is about organising pastoral care, in agreement and harmony with the ecclesiastical hierarchy on the ground." "Yes, I know there is opposition - or rather, we say, disagreement - but I cannot say anything in detail because I have never been to Medjugoije. This is where I can appear as someone who is neutral in this conflict." Asked if his proposals might include the appointment of an apostolic administrator for Medjugoije, the Pope's envoy said "Yes, this is not impossible. Perhaps one will have to supplement the structure of the hierarchy on the ground so that initiatives can be better coordinated and thus more effective. I must confirm that these are only hypotheses." Msgr Hoser added that he did not know when his report to Pope Francis, or any other, would be published. Medjugorje's parish priest Marinko Sakota responded to the the news of the appointment of a special envoy saying: "This is an answer to prayer, a moment of grace and joy, and also a time of great responsibility for the parish of Medjugorje." Archbishop Henryk Hoser: We should not be worried about Medjugorje! This is the affirmation offered to Aleteia from Archbishop Henryk Hoser, a special envoy sent by Pope Francis to investigate the situation surrounding the reported Marian apparitions in Medjugorje, a small town in the Herzegovina region of Bosnia and Herzegovina, close to the border with Croatia. Pope Francis appointed the archbishop in February to be the Holy See’s special envoy to the site, where millions of pilgrims have visited since the apparitions were said to begin, in 1981. The archbishop told Aleteia some of the details of his mission. Konrad Sawicki: When will Your Excellency leave for Medjugorje? Archbishop Hoser: I have recently heard that I am allegedly there and that I have been miraculously healed by the Holy Virgin Mary… Joking aside, my first visit to Medjugorje, an orientation one, will start at the end of March. This will be Your Excellency’s first visit to the shrine. Yet this is not going to be Your Excellency’s first special mission, is it? It is true I have never visited Medjugorje myself, but a lot of the faithful from my Diocese of Warsaw-Praga go there and I am well-familiar with their accounts. The mission entrusted to me is auxiliary to what the doctrinal commission has accomplished. Every year the shrine is visited by 2 to 2.5 million pilgrims from across the world. It has become a charismatic place. The fact that Medjugorje is visited by so many faithful, who are no doubt spiritually enriched there, is something to be borne in mind. A demand for pastoral care in this place is huge. Imagine – there are 50 confessionals on the premises. The problem is that often there are not enough confessors speaking different languages. After the nomination of the special envoy and the publication of a letter by the local bishop, which contests the authenticity of the apparitions, many faithful around the world are concerned. Was their pilgrimage to no avail? Were their prayers untrue? – they ask. Could Your Excellency as a papal pastoral envoy explain the current situation to them and dispel their worries? We should by no means worry! The Church has not yet spoken on the authenticity of the apparitions. We should calmly wait for the final position. This is by no means the first situation when the Church is slow to take a decision, especially given that the form of the Marian apparitions in Medjugorje significantly differs from that of earlier well-known apparitions. Besides, this issue will not change anything in the teaching of the Church concerning Marian veneration. If Marian devotion has flourished in Medjugorje, if such multitudes arrive there, it is therefore a place where veneration will continue, since Our Lady can be venerated everywhere, especially in those locations where this veneration is so fruitful, as we hear it has been from so many testimonies. Let me take this opportunity to greet Your Excellency on behalf of the editors and readers of Aleteia and wish you a complete and fast recovery. Would Your Excellency like to address our staff and readers? I would like to ask the Aleteia readers to pray for the success of my mission in Medjugorje. I embark on this mission on behalf of the Church, entrusted to me by the Holy Father. I want this mission to come closest to objective truth and to produce very good and concrete results. Henryk Hoser, Bishop of the Diocese of Warsaw-Praga, was born in 1942 in Warsaw. A graduate of a university school of medicine, in 1968 he entered the Society of Catholic Apostolate (the Pallottines). Having obtained degrees in philosophy and theology and having been ordained to the priesthood, he left for Paris and then for a mission to Rwanda (1975–1996). In 1978 he established a Medical and Social Centre in Kigali and led it for 17 years. He also set up the Family Formation Center (Action Familiale). After the civil war in Rwanda, the Holy See appointed him apostolic visitor in Rwanda. In 2005 John Paul II appointed him archbishop and auxiliary secretary of the Congregation for the Evangelization of Peoples and Chairman of the Pontifical Missionary Works. In 2008 Benedict XVI named him Bishop of the Diocese of Warsaw-Praga. On 11 February 2017 Pope Francis nominated him a special envoy of the Holy See to Medjugorje. At the beginning of 2017 Archbishop Hoser revealed that he is suffering from malaria. At the end, Archbishop Hoser invoked the blessing of God upon all those gathered in the church. On Saturday evening in Medjugorje, Archbishop Hoser celebrated the 6pm Mass in St James'. There have been so many arguments about whether the church was going to close down Medjugorje etc yet here we have an amazing confirmation that the Holy Father is happy with what is going on there. This is a much more important development than I had thought possible just a month or two ago. It is a personal 'thumbs up' from Pope Francis. Archbishop Henryk Hoser, appointed as special envoy to Medjugorje by Pope Francis, celebrated his first Mass in St James church on Saturday evening. In his homily, spoken in French, the traditional diplomatic language of the Church, the Polish prelate said, "Let us pray for peace because the destructive forces are immense, the arms race is on the rise, people are torn apart, families are torn apart, societies are torn apart. We need an intervention from heaven! And the presence of the Blessed Virgin is this type of intervention. It is an initiative of God. And so, I would like to encourage and comfort you as a special envoy of the Pope. "Protect the world with peace through conversion of the heart; the greatest miracle of Medjugorje is the confessions here. The sacrament of forgiveness and mercy. It is a sacrament of the Resurrection. I thank all the priests who come to confess here, about fifty- today, in the service of the people. "I have spent many years in the West where confession has disappeared and personal confession no longer exists except here and there. The world dries up, hearts are closed, conflicts multiply. "[...] Let us be the apostles of the good news of conversion and also of peace in the world. [...] Whoever touches the love of God, his Mercy, sees something irresistible and cannot resist. "We are witnesses of what saves life. We are witnesses of what saves the world. The Franciscan friars said that there are pilgrims who come from more than 80 countries from around the world. This call can spread to the ends of the Earth as Christ said by sending his apostles. "Mary is with us and shares in our suffering and pain. She helps us, helps to bring us to repentance and to feel its spiritual presence. We call her, especially here, the Queen of Peace and invoke this title when we pray the litany of the Blessed Mother. [...] She participates in the reign of her Son. [...] We thank her for her constant presence with each of us. The Queen of Peace brings peace to our hearts, and so to our families, our country and society. "You are therefore witness to Christ's love of his Mother's love and the love of the Church. May God bless you and strengthen you. Amen. The video has a running English translation. There are some very interesting questions towards the end! It is amazing (actually not so amazing!) that the religious (and secular) press who have happily reported negative 'news' about Medjugorje seem to have little interest in this new and remarkable development in the Medjugorje story. “It is important to grow Medjugorje. People discover something extraordinary at Medjugorje There is an atmosphere of peace and reconciliation. An atmosphere of peace of the heart – an inter peace of the heart. At Medjugorje there is a huge space for spirituality. People rediscover something sacred, something holy There is something divine when we honor Our Lady. 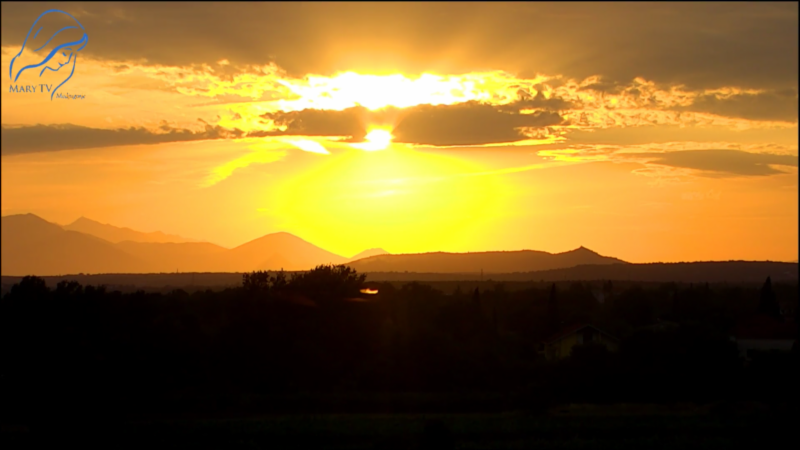 “You can say to the whole world that there is a light with Medjugorje and you can find the light again. We need these spots of light in the world that is going down to darkness. So friends, be carriers of this joyful news. In Fatima we have seen a great testimony of popular faith, the same one that is also found in Medjugorje. What do you think of those apparitions and the religious fervor that they have generated, in the light of having decided to appoint a bishop delegated for the pastoral aspects? I have no doubts about Medjugorje and I have no doubts about Pope Francis either. I rather suspect he has been strongly influenced by the flood of non-authentic 'messages' that have emerged from South America over recent years. But note how gentle he has been in dealing with events that he finds difficult to accept. It is a lesson in itself. And here is the video of Pope Francis on the plane saying what I've quoted above. And now the 'Vatican Insider' has published the findings of the Ruini Commission report on Medjugorje. The writer of the article, Andreas Tornielli who is a strong supporter of Pope Francis, does not state the source of his information. from all over the world..was awesome. I felt the Blessed Mother brought me there in the most indulgent way possible. Popes in the past got some confirmation on apparitons from the Blessed Mother herself, witness Fatima. I am confident she will do the same again. I was very surprised by this development. But somehow it makes Francis more human for me! He really has got it wrong and I’m surprised that he seems able to recognize the fruits but not the tree producing it! Archbishop Hoser officially begins his ministry in Medjugorje this Sunday, July 22, with Holy Mass presumably in St James. MaryTV will be broadcasting the Mass. Chiara Amirante, founder of the Nuovi Orizzonti Community in Italy (see PS1) is a woman who deeply loves the Church and has a privileged place in Rome. John Paul II named her consultant for the dicastery for the Pastoral Care of Migrants, then Benedict XVI named her consultant for the Pontifical Council for the New Evangelization, and finally she was one of the first women called to the synod. This has enabled her to meet with Pope Francis several times. After the Pope’s statements about Medjugorje when he returned from Fatima on May 13, 2017, Chiara had several encounters with the Holy Father. In one of them which lasted more than an hour, Medjugorje was at the heart of the conversation. 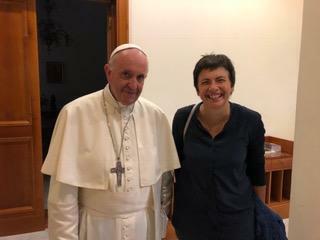 I have known Chiara for more than twenty years, and I am glad to see that a person so well trained at the school of Mary had the opportunity to be heard by the Pope. Chiara has so deeply embedded the messages of the Blessed Mother into her life that she radiates the motherly light of Mary, and thus attracts many people to God, especially young people who are wounded by all sorts of addictions and wrong doings in the world. Her vocation is to bring out those who have fallen into this pit of hell and who can find no help in our society. This is a great challenge! “I would like to share a piece of news that has given me great joy. It is true that the statement by Pope Francis on 13 May 2017 in the Lisbon plane gave us a blow to the heart: “I prefer the Virgin Mother, our mother, rather than the Virgin as head of a telegraph office who sends messages every day at a specific time… That is not the mother of Jesus… Who thinks the Virgin would say: So, come tomorrow at such and such a time, and I will give a message to such and such a visionary? No, that can’t be!”And even if Pope Francis then added: “In Medjugorje there are fruits, so many fruits”,this did not alleviate our grief caused by this assertion: “This is not the mother of Jesus”. After this statement was broadcast by all the televised newscasts in the world, I had the grace of meeting the Holy Father. Know that I have his blessing to talk about his words on Medjugorje. I felt the need to speak with him, because I see that some information circulating in the Vatican is not true. For example, ill-informed priests believe that Mary has already given more than 50,000 messages, which led Pope Francis to believe that she was giving several appointments each day to several visionaries to say different things. So I pointed out, “No, that’s not it at all! To date, there are only 672 messages. There is the monthly message on the 25th, given to Marija for the world, and one on the 2nd received and conveyed by Mirjana.” Pope Francis then told me that he had “saved” Medjugorje. In fact, the Congregation for the Doctrine of the Faith wanted to issue a negative opinion, but he supported the Ruini Commission which expressed a positive opinion on the first apparitions. The Holy Father said “Medjugorje is very much close to my heart!”During the press conference on the Lisbon plane, he pointed out that there were fruits, that this could not be denied. He sent Mgr. Hoser precisely because he believes that the fruits are important, and that Medjugorje must be protected. He told me that he was the one who authorized the pilgrimages. He is now rallying – for the moment through his envoy, Archbishop Hoser – to keep all that is beautiful in Medjugorje. 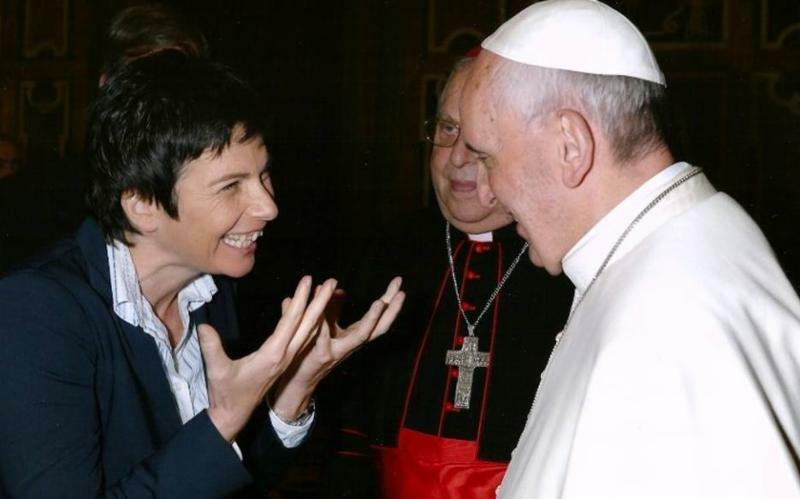 I want to add a little more information about the above meeting that Chiara Amirante had with the Pope at the end of last year. 'Chiara, look, it is I who saved Medjugorje, because the Commission of the Congregation of the Doctrine of the Faith, on the basis of so much false news, had already said that Medjugorje is all false. So I saved Medjugorje myself, it is I who have Medjugorje at heart, it is I who sent Hoser because I believe, what I also said at the press conference, that the fruits are many and are unequivocal' . On the basis of the above, I think it would be correct to infer that whatever we now hear from Archbishop Hoser on Medjugorje will represent what Pope Francis himself believes.